Pics and Kicks: Starter DSLR: DEAL! about a starter level DSLR. and they've got some smokin' deals on jut such Canon cameras! Check all the deals out here. they're also FANTASTIC all around family cameras! I would recommend any of the above. that is the best fit financially! unless it's from a reputable site like B&H. 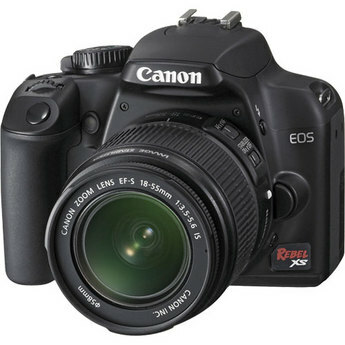 I have a Canon Rebel XSi. Love it. I love my rebel 2ti!! :) I wish I had known about b&h when I was looking to buy it though! Those prices are great! Just got the t1i...LOVE IT so much. I wanted to get the D7, but couldn't justify shelling out 2grand. This is a great compromise camera. I'm in the market for a good dslr and finding this comment was very fortuititous. I'm going to go check out local prices today and I'll let you know how B&H compares. My husband and I are poor students about to embark on an international university sponsored 5 month adventure. I have been planning on purchasing one of these cameras for the trip (and life in general) for a while now, but with us leaving in two and a half weeks it is crunch time. I need to decide and buy one soon. I was looking on B&H and saw that they also have used cameras available for sale. Is this a safe buy, or should I spend the extra cash and get a new one? it totally depends on how much you'd be saving and the guarantee that b and h offers on used gear. just be very wise and careful and if you aren't saving much, I personally would just try my hardest to come up with the difference and buy new.